A loud and forceful jumbo with escellent electronics for stage use. 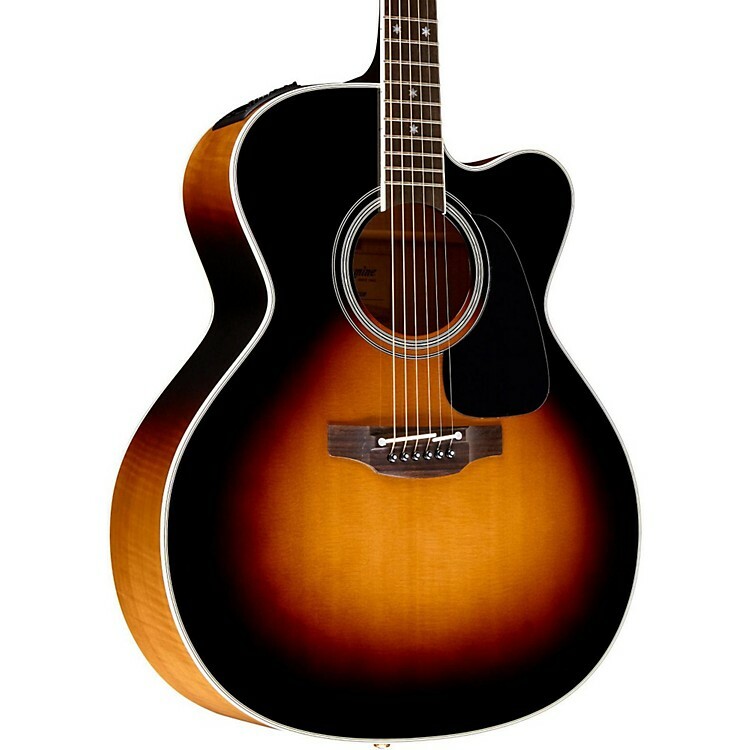 Takamine' P6JC jumbo cutaway model is loud and forceful, with a resonant solid spruce top with scalloped œX top bracing for maximum volume, a solid flame maple back and flame maple sides, a convenient Venetian cutaway for easy access to the upper reaches of the fingerboard, and elegant body binding with black and white purfling and mother-of-pearl rosette. Built with the performer in mind, the P6JC features Takamine' proprietary CT4-DX preamp system and unique Palathetic under-saddle pickup for superior amplified response. The dual-channel CT4-DX provides a four-band EQ, two feedback-reducing notch-filter controls, a flexible dual-pickup mix control (for use when a second pickup is added), volume control and an onboard tuner. Other performance-enhancing features include Takamine' asymmetrical neck profile “ which is slightly thinner on the treble side so that it fits the natural shape of your hand, resulting in a comfortable feel and improved playability. The split bone saddle provides more accurate intonation, while bridge pin positioning optimizes break angle to improve sustain and presence. Premium design appointments include an ebony fingerboard with white binding and mother-of-pearl œdot-in-dot inlays, a black headcap, gold tuners with pearl buttons, a natural bone nut and gloss natural finish. The P6JC comes complete with a premium archtop hardshell case.